Moonstone under normal illumination and under short wave UV light. You can see another example of fluorescent moonstone (anorthoclase) at the Online Mineral Museum. 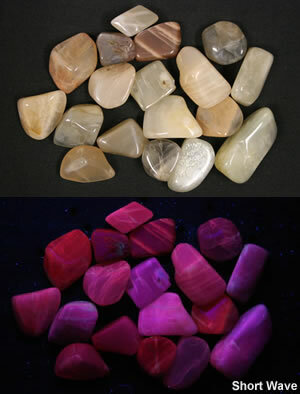 We tested some moonstone with our ultraviolet lamp and were really surprised by the beautiful red fluorescence. The gemstone known as "moonstone" is an alkali feldspar mineral known as anorthoclase or adularia. Some specimens exhibit a beautiful red fluorescence under short wave ultraviolet light as shown in the photograph at right. These beige, pink and gray specimens of colored moonstone are about 3/4" to 1" in size and are from a location in India. It is interesting how the twinning in some specimens in normal light can be very clearly seen under ultraviolet light. No Adularescence Under UV Light? Moonstone gets its name from the moonlight glow that floats just beneath the surface of some specimens when they are turned under incident light. This floating glow, known as "adularescence," is produced by a reflection of diffused light from parallel intergrowths within the stone. However, when viewed in ultraviolet light, adularescence is not observed. The reason adularescence is not observed is that a different type of light is involved. The fluorescent red light is being "emitted by the stone" instead of being reflected. Adularescence is incident light being reflected from points within the stone. Too bad! Fluorescent adularescence would be cool. Not Your Normal "Black Light"